It's like the story of Snow White, and just like the wait to be woken from her slumber, this happy ending was a long time coming. This week the stunning Fiji Marriott Resort Momi Bay was the backdrop for the romantic finale of the Australian Bachelorette starring Sophie Monk (we knew it would be Stu). It seems fitting that this magnificent resort is now one of Fiji's fastest rising stars - particularly as it didn't look like it would turn out that way. Earlier this year I got the chance to stay following its official opening. As all eyes focus on the resort's dreamy lagoon and romantic overwater bungalows, I thought I'd share our experience of staying at this wonderful property..... perfect for families and loved up couples alike. Personally, I've always been a little biased towards the outer islands, but we loved it so much we're planning our trip back.... sooner than you can say coconut daiquiri. Thirteen years ago a deal was struck to build one of Fiji's finest resorts; the first on the mainland with over-water villas. With a striking design centred around a man-made lagoon, the 250-room resort would offer almost every guest a water view. There would be a choice of incredible restaurants, a cafe, bakery, spa, three swimming pools and private white sand beach. Then disaster struck when New Zealand finance company Bridgecorp collapsed. The Fiji Marriott Resort Momi Bay was Bridgecorp's largest property project in Fiji. For a decade, the partially built resort languished in the muddy, unfilled lagoon; a symbol of broken promises, failed government investment and mismanagement. I visited Fiji umpteen times during this period and never had the slightest inkling that a sleeping beauty lay waiting to be rescued. Today, the view from my contemporary lagoon bure, incorporating natural materials and Fijian motifs melded with crisp white, is reminiscent of Tahiti or the Maldives. Across a sandy, palm fringed beach is a now sparkling lagoon where 22 luxurious (adults only) overwater villas branch out invitingly under a sunny sky. My daughter Ella collects hermit crabs on the protected beach with toddler Ruby, who is staying in a neighbouring bure. A guest in the over-water villas dons mask and flippers and snorkels from the steps of his room. Surely this is one of Fiji's best resurrection stories. Ella and our neighbour Ruby in one of the deluxe lagoon bures - perfect for families! That night we dine with the resort's gregarious general manager Silvano Dressino and his family at the Fish Bar, which serves up stellar cocktails (try the Countess) and superb seafood. 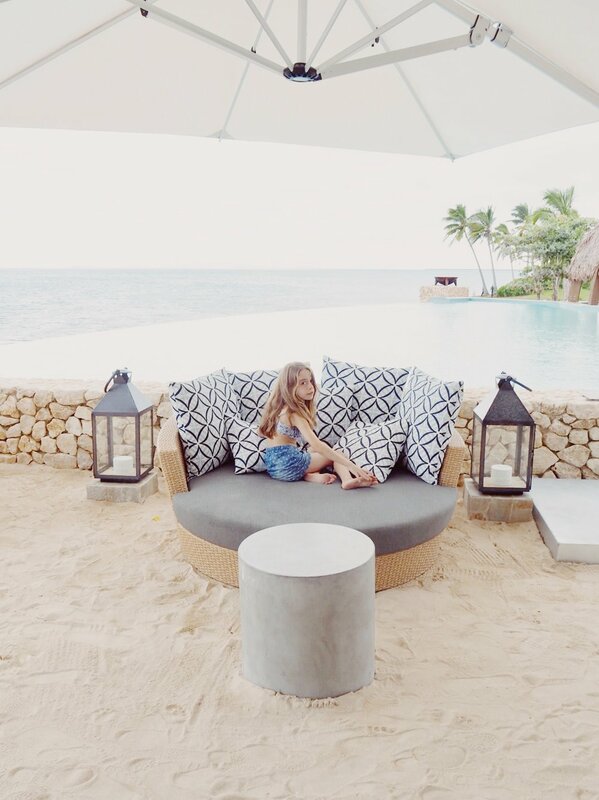 With its oversized lanterns, limestone walls juxtaposed against the blues of the Pacific Ocean on the west coast Viti Levu, we kick off our shoes and sip cocktails with sand between our toes. Ella chilling at the Fish Bar. Just beyond is the adults only pool. Bliss! The German-born Dressino had just five short months to open the first Marriott-branded resort in Fiji. And while there are the normal teething problems that come with any new resort, coupled with the fact that this is one laidback country (Fiji time anyone? ), he can be proud of what's been achieved. For those coming to Fiji to relax, swim and dine, the five-star resort which opened in April ticks all the boxes. The moment you arrive through rolling green hills and see the ocean on one side, lagoon on the other, you're instantly on island time. There are verdant gardens, swaying palm trees, and water vistas at every turn. The tranquil swimming lagoon (advisable to wear reef shoes) is terrific for kids, with wide stretches of sand to play. While the over-water villas give the resort a "Bora Bora" look, in truth the water is nowhere near as inviting as what you'll find in the outer islands. And it's not filled with tropical fish and coral either. On the flip side, you're not paying what you would for an over-water bungalow at Likuliku on Malolo Island (Fiji's first over-water villa resort); or anywhere near what you'd fork out for something similar in the Maldives. The lagoon is perfectly nice. The water is languid and it's lovely to kick back on a sunlounge on your deck and just stare vacantly at it. The best place for swimming, we find, is at North Point (the furthest point of the resort) where the sea flows in to the lagoon. Here the water is at its clearest; although be warned – if you swim straight from the jetty it's quite a feat getting out again unless you have the upper-body strength of Ian Thorpe. More inviting, swim wise, are the resort's pools. There's a choice of two: the main pool with swim-up cocktail bar (including a shallow kids' section down one end), and the serene adults-only pool which sits next to the Fish Bar overlooking Momi Bay. Families are well looked after here, but equally so are those travelling sans children. There's the aforementioned family pool and the large, well-equipped all-day Turtle Kids' Club offering supervised indoor and outdoor activities including movies, console games, fish feeding, sand sculpting, puzzles and books. The kids' club also has an enormous outdoor covered play area which you can access outside operating hours (9am-5pm with a break for lunch; plus an evening program for $FJ25 per child). Like many Fijian resorts, aside from those on Denarau Island, you're pretty much restricted to dining in-house but there are several dining and culinary experiences to choose from. The Fish Bar, with dishes like fresh sashimi and fried soft shell crab, is my pick, and it's also the best spot to catch one of Fiji's blazing sunsets with a tropical cocktail in hand. The Goji Kitchen and Bar offers all day dining with an Asian infused menu for lunch and dinner. We only tried the breakfast here which is a lavish buffet spread including egg station, dumplings, French toast, fresh fruit and an impressive pastry section. The chic Lagoon House Restaurant and Bar is Mediterranean-inspired offering pizzas, burgers and tapas share plates. The space is light and airy with an open kitchen and windows that open up to views across the lagoon. There's also a casual bakery and a coffee lounge. All up there's a choice of 10 different styles of rooms including the over-water bures, deluxe lagoon rooms (many of which interconnect), and duplex ocean front or lagoon bures. Designed by Fiji's Architect Pacific, the striking timber shingled bures were inspired by a canoe shed, or the upside down hull of a drua (double hull canoe). Joinery including beds, hand basins and curved mirrors are made of local Fijian mahogany. Throughout the resort there are also hand-carved timber bollards depicting Fiji's marine life. What's nice about all the rooms - whether it's the lead in deluxe lagoon view rooms, or the schmick overwater bungalows - is they're all chic, spacious and, as indicated by their names, all have a view of the water. The benefit of the lead in rooms too is they are close to all the action including the family pool, the restaurants and the kid's club. Our room, a lagoon bure, was actually quite close to all the facilities on offer, but some of the ocean bures or lagoon bures are quite a walk - nice if you want privacy, tricky if mobility is an issue. The good thing is however that no matter what room, you can ring reception and a buggy will come get you. There are activities aplenty if that's your bent: basket weaving, volleyball, footy matches between staff and guests, stand-up paddle boarding and snorkelling (although I'm not 100 per cent sure what you'd see). There's also a huge gym, a beautiful looking spa which I didn't get to try, and tennis courts. You can do any number of tours from the resort including the Sobeto Hot Spring and Mud Bath, jet ski tours and surfing at the famed Cloud 9 surf break. Sandy beaches and calm water, ideal for kids wanting to play in the sand. Our favourite thing to do, however, is a whole lot of nothing; hanging out on the beach in front of our bure and exploring other sandy coves, which is exactly what we were doing on our final morning before heading home to dismal, wet weather. Always an opportunist, Ella spies some fallen coconuts and decides to lug them back to our bure – carrying one under each arm, stopping regularly for rest breaks. Finally, back at our room one of the friendly gardening staff sees Ella vainly using a bread knife to cut one open. "They're no good," he tells her, "wait here". About 15 minutes later he reappears with a freshly picked coconut in his wheel barrow. Lopping off the top with a machete he hands it to Ella with a huge smile. Thanking him, we pop a straw in the top, sit in the shade and drink its fresh, sweet juice. "Now that's five-star service," I say to Ella as we soak up our final moments at this resort finally given the fairytale ending it deserves. Fiji Airways flies daily from Sydney, Melbourne and Brisbane to Nadi (see fijiairways.com) and has recently launched a twice weekly service from Adelaide; see fijiairways.com. The resort is a 45-minute drive from Nadi International Airport. Sheriden Rhodes was a guest of Marriott International.